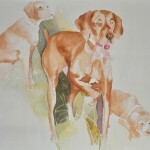 1I have been painting watercolors for for over 30 years. It started in 1977 when I first moved to New Mexico and joined my Mom in a painting class from Santa Fe artist Lee Romel. I learned many wonderful techniques from Lee and appreciated the opportunity to learn from her. Another mentor in my life lived next door to my parents who taught Saturday morning classes in a room at the post 49 on Central Ave. This wonderful lady was Dorothy Lawrey Vorhees. Dorothy was monumental to me becoming a serious watercolorist. As a mentor, I learned so much from her and will always be grateful to her. She introduced me to the New Mexico Watercolor Society and juried exhibitions such as the summer New Mexico Arts and Crafts Festival as well as the November Southwest Arts Festival. I prefer to paint natural subject matter, New Mexican flora and fauna, painting the flowers, cactus and other organic material as well as animals like dogs, cats, wild birds and chickens are often inspiration. 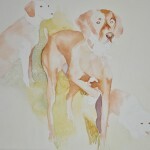 I love to paint peoples’ pets. 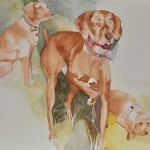 I am currently working on a series of pet paintings, I enjoy capturing the personality of all my canine, feline and poultry friends. 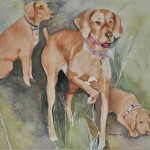 This painting below is “Piper.” She was a beautiful 2-year old Vizsla that crossed the rainbow bridge May of this year 2014. I wanted to do a portrait for her family as she was very loved and will be missed greatly. I have posted stage photos as the painting progressed.